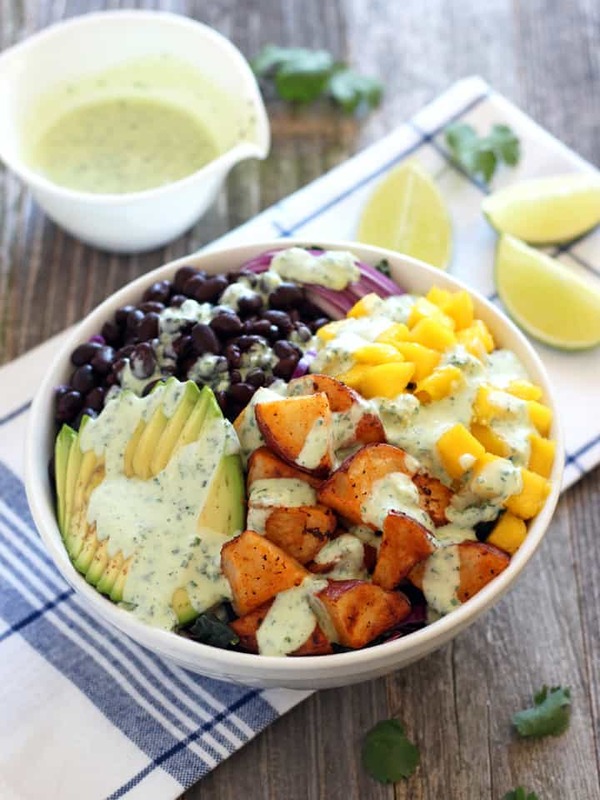 You are going to love diving into these sweet, spicy, tangy Mango Sriracha Potato Veggie Bowls! Mango, potatoes, avocado, cabbage and kale all drizzled with a tangy yogurt lime dressing. This might kill any veggie cred I’ve earned…but for most of my life, I thought you could only make a salad with lettuce. For years I was beholden to a set of rules that salads were to have lettuce (Iceberg or Romaine), tomatoes, cheese and bottled dressing or oil and vinegar. Thankfully, I discovered those pesky salad “rules” were meant to be broken! Now, I wildly fill my bowl with crunchy red cabbage and kale instead of lettuce. Tossing in CHOPPED FRUIT with abandon. Loading up on CREAMY AVOCADO. Oh and a half batch of warm spicy sriracha roasted red potatoes or Addictive Roasted Sweet Potato Rounds! Crazy sounding I know but hot potatoes are the best addition to a crispy salad. The trick is to add them right before serving so they only slightly wilt your greens. If you’ve haven’t tried our Sriracha Vinaigrette I feel the need to include a disclaimer. We like our dressings tangy, bold and in your face. This Yogurt Lime Dressing hits those marks with almost a hand-full of cilantro, a whole clove of raw garlic, tangy Greek yogurt and a ton of citrus flavor. 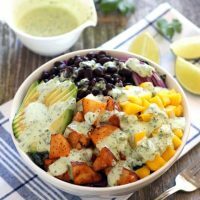 The recipe goes heavy on the lime, so if you’re looking for a little less citrus – creamier style dressing there are a lot of awesome delicious options. 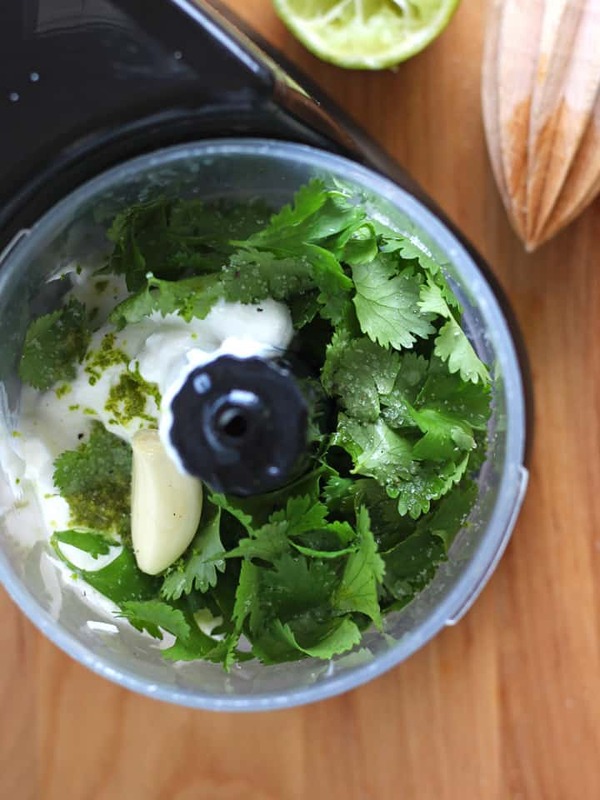 Like the Cilantro Lime Dressing from Damn Delicious that uses olive oil and vinegar or this Creamy Cilantro Dressing from LaaLoosh with 3 cloves of garlic and Parmesan cheese. But really use any dressing you like, add crumbled cotija or feta cheese, skip the red onions. 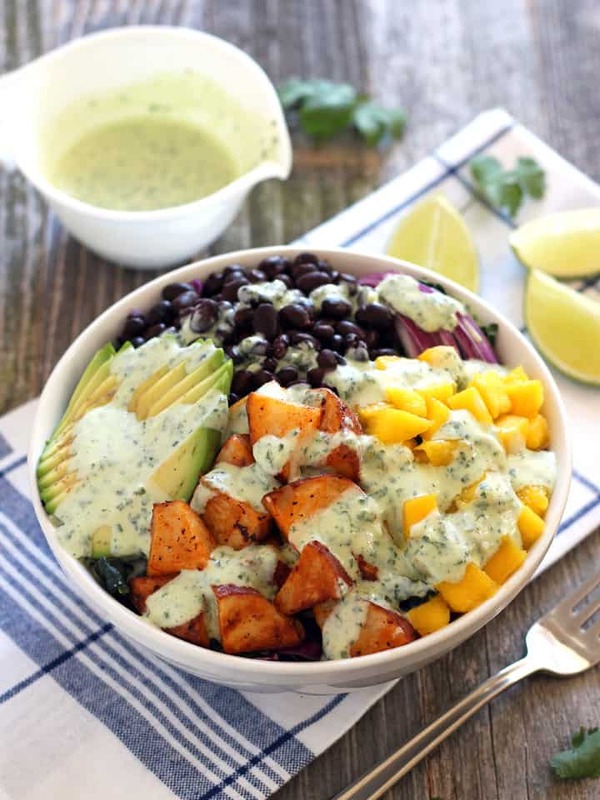 Make these Mango Sriracha Potato Veggie Bowls your own …there are no rules here! If meatless meals for two are your jam, make sure to check out this Roasted Baby Potatoes and Chickpea Salad recipe, it’s super-filling but light on the effort or this toaster oven sheet pan supper of One Pan Roasted Gnocchi and Vegetables it’s simple to customize and cooks up quickly! Sriracha roasted potatoes, mango and avocado on a bed of crunchy cabbage and kale. Drizzled with a tangy cilantro lime dressing. Place roasting pan in toaster oven and preheat to 450 F.
In a medium bowl whisk together the olive oil, sriracha sauce and garlic salt. Add chopped red potatoes to bowl and stir well to coat potato chunks. Lightly season with salt and pepper if desired. Using oven mitts carefully remove the heated pan from your toaster oven. Carefully add oil coated potatoes to pan (the oil will pop and splatter), use a rubber spatula to scrape all of the oil mixture from the bowl onto the potatoes. 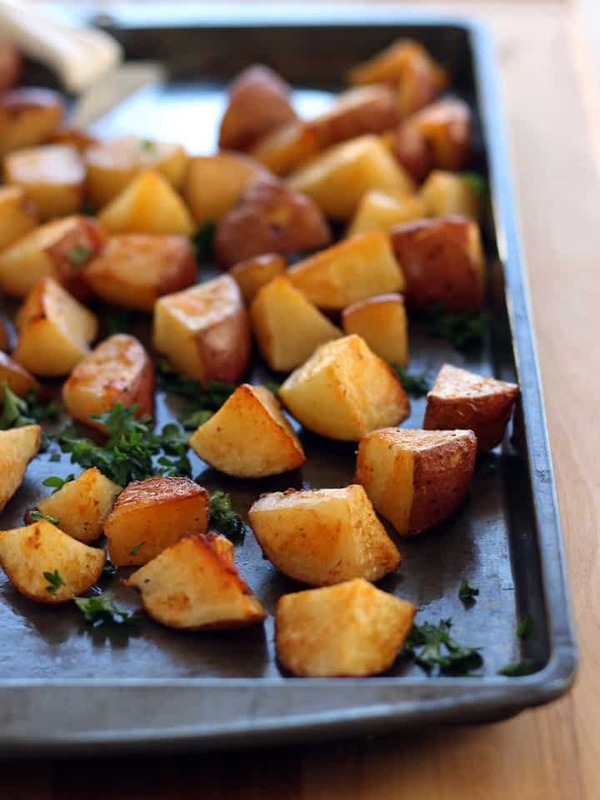 Spread potatoes into an even layer and return pan to toaster oven. Roast potatoes at 450 F for 30 to 35 minutes. Stir potatoes about every 10 minutes to keep them from sticking to the pan and assist with even browning. Potatoes will be done once they are crispy on the outside and fork tender. Allow potatoes to cool a few minutes before adding to bowls. While the potatoes roast divide the cabbage and kale evenly between two bowls. Top bowls with equal amounts of black beans, red onion, avocado and mango. To make the dressing combine all of the dressing ingredients (except half of the lime juice) in a mini food processor and process until smooth. Add additional lime juice a teaspoon at a time until desired consistency achieved. 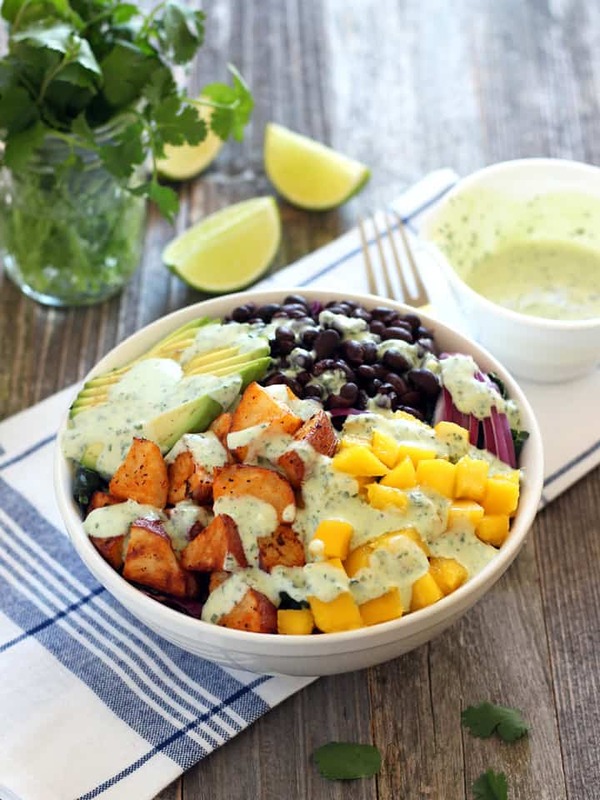 Top salad bowls with the slightly cooled potatoes, drizzle with tangy cilantro lime dressing and dig in! If you have leftover dressing it can be stored in the fridge for up to 3 days and is a delicious dipping sauce for raw veggies. 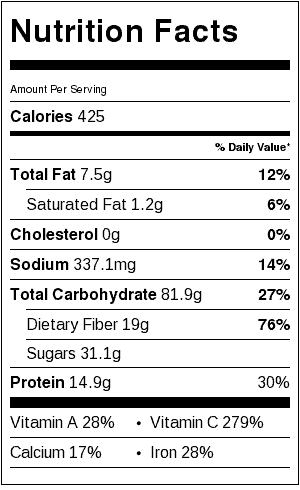 Nutritional information is an estimate for 1 of 2 bowls with half of the dressing (though you'll probably use less than that). See the original full-sized Spicy Sriracha Roasted Red Potatoes recipe for more tips on getting perfectly cooked crispy on the outside creamy on the inside potatoes. This recipe was submitted to Meat Free Mondays at the tasty vegetarian blog Tinned Tomatoes – check it out every Monday to plan your yummy meat-free week!